Cranberry Pie Recipe calls for just six ingredients, and helps you celebrate the holiday season and harvest in a whole new way. I am a huge fan of cranberries, and love finding ways to use them in more than just cranberry sauce and juice. I think if you use cranberries in the right way, you can make believers out of the most difficult critics. 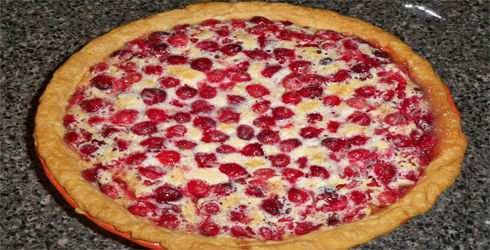 Cranberry Pie highlights the best qualities of cranberries. You still get that bit of tart, but it is completely tamed down with a creamy, sweet, pudding like filling surrounding the cranberries. I think this is an excellent alternative to traditional pies and desserts served at holiday dinners. A little tip about the cooking process, you want to cook the pie long enough for the cranberries to pop open and get the sweet goodness inside and the tart spread around. My oven cooks a little low and slow, so I had to keep it in the oven a bit longer than the directions call for. Before you take your pie out of the oven, just make sure it looks like the majority of cranberries have popped open. Summary: Cranberry Pie Recipe calls for just six ingredients, and helps you celebrate the holiday season and harvest in a whole new way. Preheat oven to 425°F. Roll out pie crust and arrange in a 9-inch pie pan. Pour cranberries into crust to form a thick layer. In a medium bowl, sift together 2/3 cup sugar and flour. In a separate bowl, beat egg white until stiff peaks form, then fold into flour mixture. Slowly stir in cream until joined. Cover cranberries with remaining 1/3 cup sugar, then pour cream mixture on top. Bake pie for about 10 minutes, then lower oven temperature to 350°F and bake for about 40 minutes more.